In the most thrilling fantasy of the year, a young girl must pretend to be a boy to rescue her brother from a secret order of monster hunters. Ottilie Colter and her brother, Gully, have always fended for themselves. So when Gully goes missing one night, Ottilie sets out to find ... read full description below. In the most thrilling fantasy of the year, a young girl must pretend to be a boy to rescue her brother from a secret order of monster hunters. Ottilie Colter and her brother, Gully, have always fended for themselves. So when Gully goes missing one night, Ottilie sets out to find him - and soon makes a horrible discovery. Gully has been forcibly recruited by the Narroway Hunt, a secretive male-only organisation that hunts savage, blight-spreading monsters called `dredretches'. Disguising herself as a boy, Ottilie infiltrates the Hunt - but quickly realises that taking her brother home won't be easy. Trapped in the heart of the dredretch-infested Narroway, it's impossibly dangerous for them to leave. But as she trains to become a Huntsman alongside her brother, hoping for a chance to escape, how long can she keep her true identity a secret? From Rhiannon Williams, the first ever middle-grade winner of the Ampersand Prize, comes book one in this bewitching trilogy about friendship, bravery and having the courage to do what's right. Perfect for fans of Withering-by-Sea by Judith Rossell and A Most Magical Girl by Karen Foxlee. Originally from Taradale, Victoria, Rhiannon Williams now lives and writes in Sydney, sharing an apartment with two friends and the ghost of a cat. She studied English and history at the University of Sydney, and completed a Bachelor of Creative Arts Honours at Flinders University. Rhiannon has a background in theatre and hopes to tell stories until the end of her days. 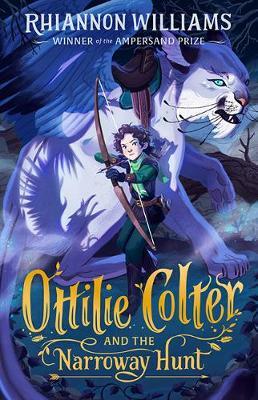 Ottilie Colter and the Narroway Hunt was the first middle-grade novel to win the Ampersand Prize. It is her debut novel.